The exhibition Chagall. The Breakthrough Years, 1911 – 1919 delves into an essential period of the artist’s work, during which he gave birth to the style that would come to characterize his whole production. The show reveals the profound motivations that guided his art the avant - garde movements that influenced him, and the crucial themes he developed throughout his career. It is an exploration of the origins of Chagall’s wholly personal and distinctive language and an immersion into the lyricism and underlying currents of his bright, colorful scenes; a voyage through his enigmatic and expressive universe, replete with creatures th at are the product of his particular mythology, figures from tales and poetry, Jewish traditions and characters, flying lovers, in images like windows that open onto new horizons. The exhibition features more than 80 paintings and drawings from the early career of a unique artist, whose seemingly simple universe conceals a complex reality where opposing worlds intertwine. Visitors to the exhibition will get a closer look at the lesser - known interpretive aspects of Chagall’s work and come to understand how the artist’s own life and experiences are reflected in them and made part of their story. Some of the issues addressed in the exhibition include the importance in his work of his native Vitebsk an d the Jewish community of his childhood; his training in St. Petersburg and traditional Russian art; his encounter with the avant - garde movements in Paris at a time when it was the capital of the arts, and where he also discovered the works of great master s in the Louvre; and lastly, his experiences of World War I and the Russian Revolution, which fostered harbored illusions that never materialized. Chagall believed that one’s inner world could be much more real than the visible world or the realm of appearances, and was devoted to painting it. He saw life as a celebration of art and his art was a celebration of life, in all its beauty an d tragedy, love and joy, the ordinary an d the extraordinary. “I do not want to be like all the others; I want to see a new world,” he claimed. During his first stay in Paris, Chagall experimented with colors, abstract and geometric forms, movement, and his own fantasies. - Transcending labels such as Cubist, Expressionist, or Surrealist, Chagall’s work is an amalgam of styles used in a personal way to tell his own story. - He combined reminiscences of Russian folk art and his family culture with the latest stylistic experiments that the Parisian avant - garde had to offer. 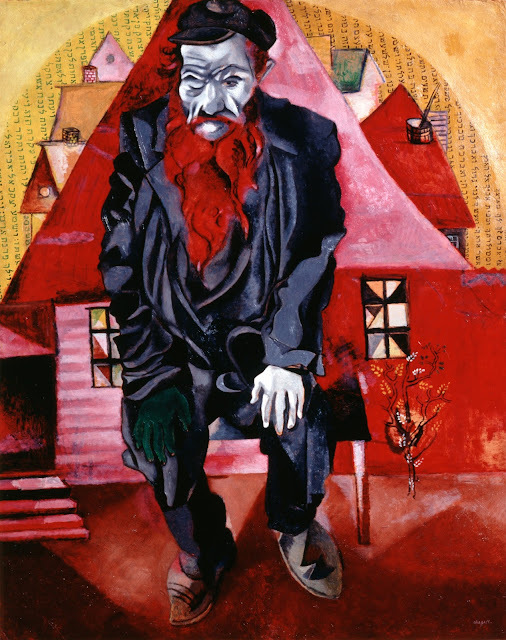 Born in 1887 to a Hasidic Jewish family in the small town of Vitebsk, then under the control of the Russian czars, Marc Chagall grew up in a very confined world, where access to Russian culture and art was limited by his own community and the government policy of relega ting Jews to ghettos and denying them basic rights. 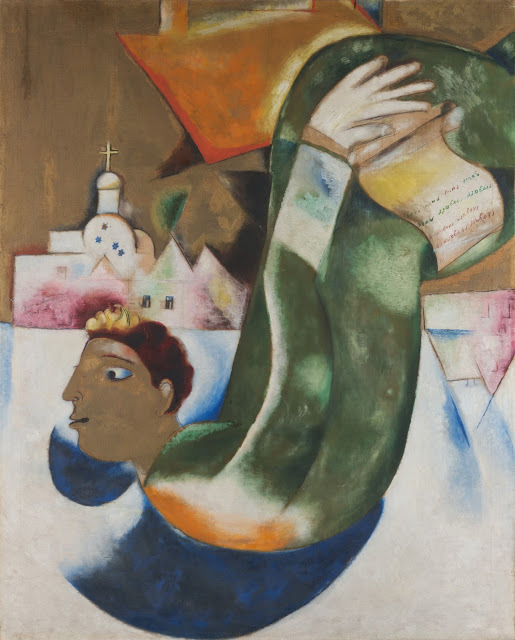 Even so, the young Marc Chagall soon made a break with convention, securing a place in a Russian school, studying art with Yehuda Pen in Vitebsk, and later moving to St. Petersburg, a major city which Jews could only enter with a special permit. 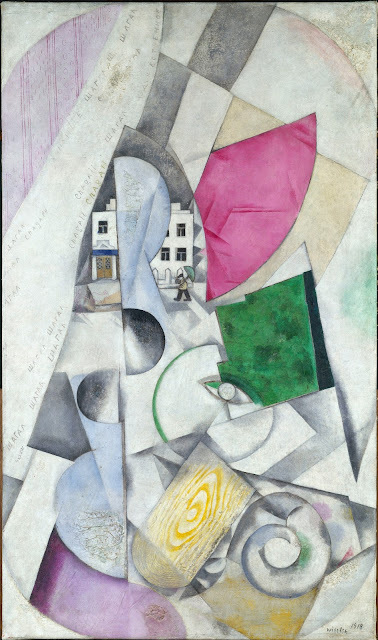 However, the decisive turning point for Marc Chagall came in 1911, when he moved to Paris and began a new life there. 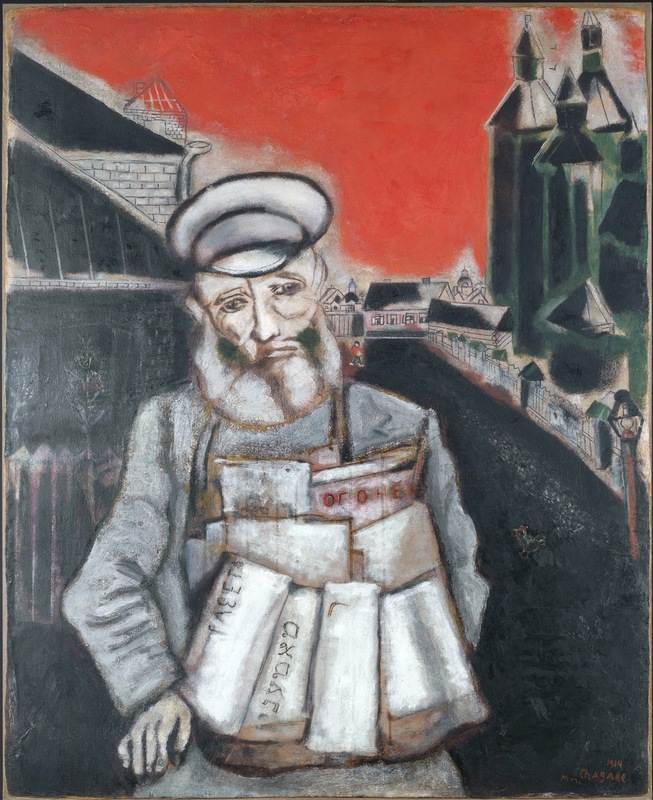 He worked in the French capital for three years, until May 1914, producing works that combined recollections of life in the Hasidic community of Vitebsk with the icons of the modern metropolis. Thus, reminiscences of Russian folk art intermingled with the most progressive stylistic experiments of Parisian avant - garde leaders like Pablo Picasso, Rob ert and Sonia Delaunay, and Jacques Lipchitz. In 1914 Chagall returned home to attend his sister’s wedding and see his fiancée, Bella Rosenfeld, but the unexpected outbreak of World War I turned what was supposed to be a short visit into an eight - year confinement. At that point, the artist entered int o a phase of intense soul - searching that is reflected in his works from this period, comprising self - portraits, everyday depictions of his family and community, drawings of the ravages of war, and images of the new Russia that emerged after the October Rev olution. G a llery 305: Paris, Hive of Artists “Impressionism and Cubism are foreign to me” * In May 1911, after studying at L éo n Bakst’s school and securing financial support from Maxim Vinaver, an important Jewish philanthropist and lawyer who fought f or the rights of his community, Marc Chagall left St. Petersburg for Paris. 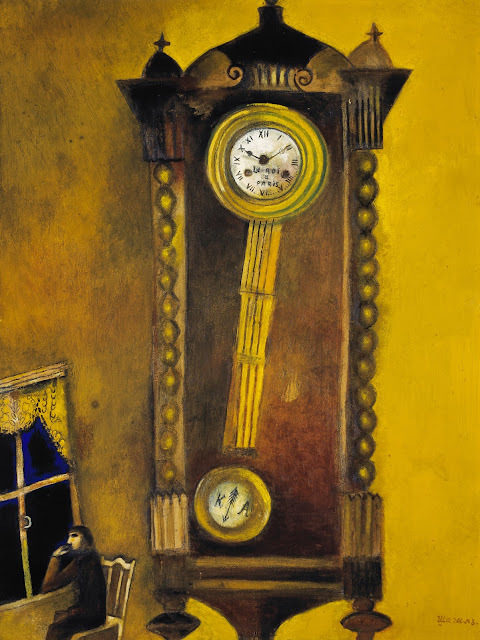 Although Bakst had already introduced him to the modern creations of Cézanne, Manet, Monet , and Matisse, it was not until arriving in the French capital that Chagall was able to co ntemplate the art of the early avant - garde movements and the old masters hanging on the walls at the Louvre. 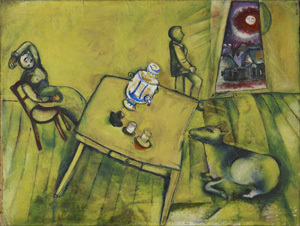 During a brief visit to his native Vitebsk, before leaving Russia, Chagall produced several drawings of his hometown and his parents, relatives, and fiancée, as well as paintings of life in the Jewish community marked by the influence of Russian folk art and a “ free ” use of color developed during his time in St. Petersburg. This is apparent in My Fiancée in Black Gloves ( Ma fiancée aux gants noirs , 1909), The Street Sweeper and the Water Carrier ( Le balayeur et le porteur de l’eau , 1910 – 11) and the drawings of his family. Upon arriving in Paris, Chagall lived in a studio in Montparnasse for several months, but he soon moved to an artists’ residence in the same area called La Ruche or “The Beehive” where, in his own words, he mixed with “the artistic bohemia of every land . ” In this great hive of reasonably priced rooms and studios for creative minds, he became friends with Blaise Cendrars and Sonia and Robert Delaunay, who introduced him to poet Guillaume Apollinaire. The latter soon became a staunch supporter of Chagall’s wo rk, describing it as “supernatural , ” which in this period denoted experiments with color, abstract and geometric forms, movement, and the artist’s own fantasies. 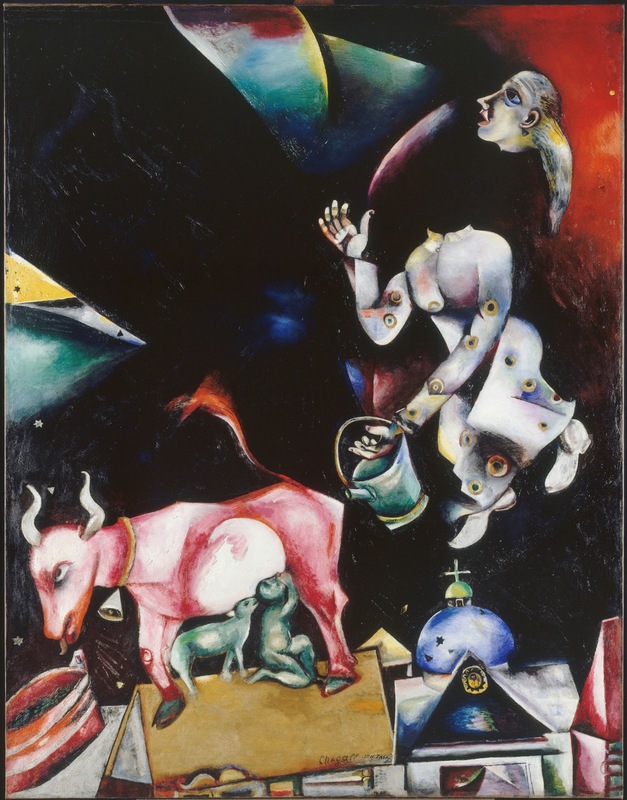 Although the influence of the “isms” flowing around him is apparent in his work, Chagall narr ated his own personal world, comprising different universes. 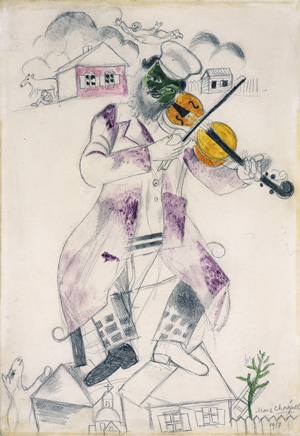 Chagall’s art, like Yiddish, is a singular fusion of languages; transcending labels such as Cubism, Expressionism, Orphism , or Surrealism, it is an amalgam of styles transformed in a personal way to tell his own story. This gallery presents works from his early days in Paris, such as The Yellow Room ( La chambre jaune, 1911) or I and the Village ( Moi et mon village , 1911), and others painted at his studio in La Ruche, including The Poet Mazin ( Le poète Mazin , 1911 – 12), The Cattle Dealer ( Le marchand de bestiaux , 1912) and Paris through the Window ( Paris par la fenêtre , 1913), a clear example of how he perceived the French city which nevertheless incorporates memories and images of his native Vit ebsk. *Chagall quote from My Life , first English edition in 1960, Orion Press, New York G a llery 306: From Paris to Vitebsk by Way of Berlin “I lie between those two worlds, looking out of the window . 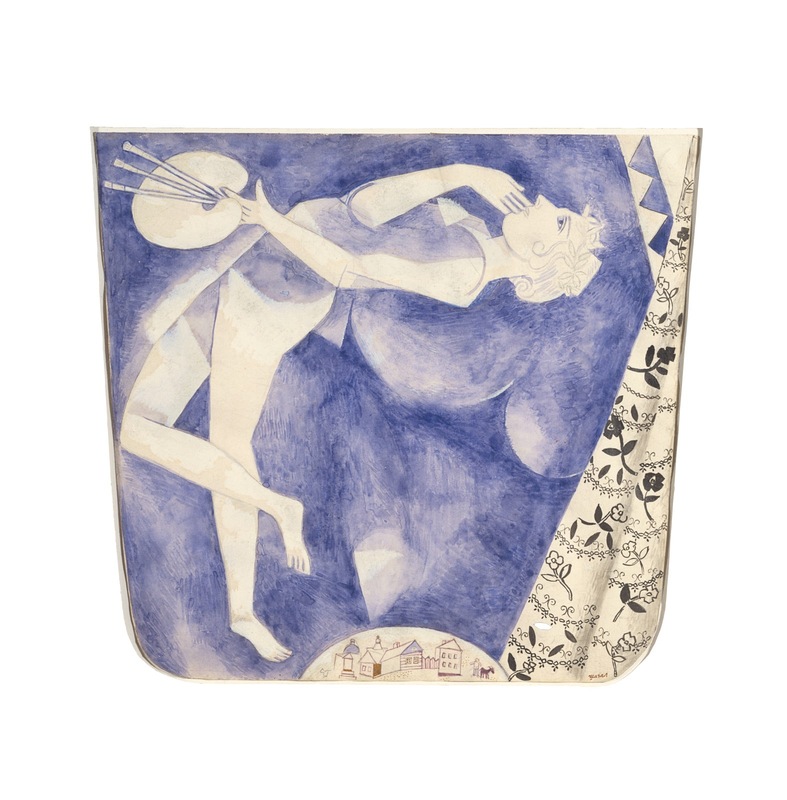 ” * No work better illustrates Chagall’s relationship with Paris than Homage to Apollinaire ( Hommage à Apollinaire , 1913 ), stemming from the painter’s admiration for Guillaume Apollinaire. At the center of this painting he depicted the birth of Adam and Eve ac cording to the Jewish oral tradition of Genesis, in which God created man and woman as a single body. Beside them he wrote Apollinaire’s name as well as those of Blaise Cendrars, a Swiss poet and novelist, Ricciotto Canudo, an Italian journalist and playwr ight considered the father of film theory, and German gallerist Herwarth Walden, all members of Chagall’s inner circle. 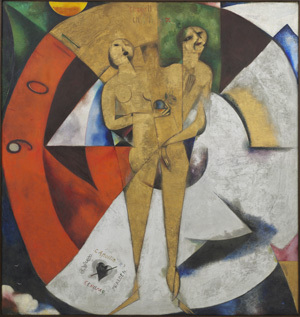 In 1914 Herwarth Walden (Georg Lewin) invited Chagall to exhibit at his Berlin gallery, Der Strum, in what would be his first major so lo show. There he presented a total of 40 paintings and 160 drawings, gouaches, and watercolors from his Parisian period, which made quite an impression on the German Expressionists. 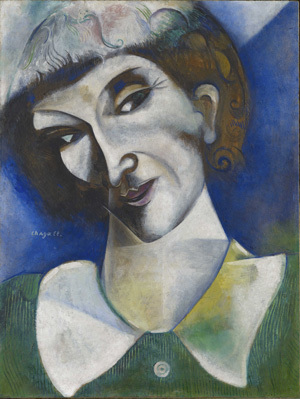 A few days later, Chagall left for Vitebsk to attend his sister’s wedding and found himself trapped in Russia for eight years due to the outbreak of World War I. 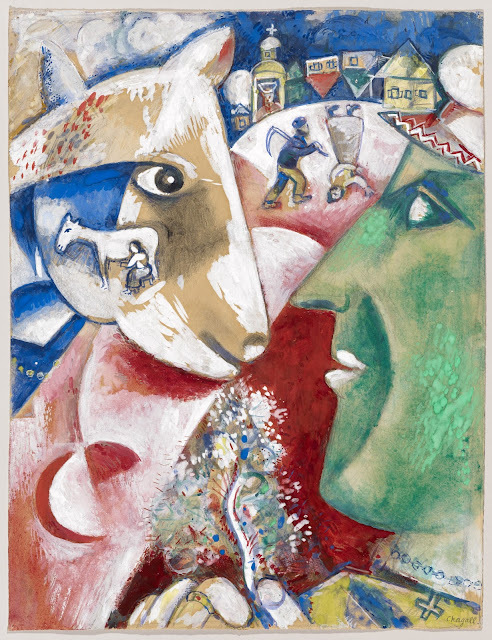 During that time, Chagall reflected the implications of war in paintings like Soldiers ( Soldats , 1914), Departure for War ( Le départ pour la guerre , 1914), and Wounded Soldier ( Le soldat blesse, 1914), but he also depicted landscapes and genre scenes using a more restrained language of limited forms and colors, with “logical” associations and scales, as illustrated by Maryasenka: Portrait of the Artist's Sister ( Maryasenka. Portrait de la soeur de l’artiste , 1914), Liozno (1914) , and The Barbershop (Uncle Sussy) ( Le salon de coiffure [ Oncle Sussy ], 1914). 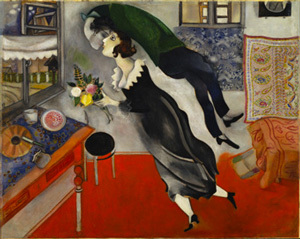 Chagall’s work took flight once more in his depictions of love and his relationship with Bella Rosenfeld, as evidenced by The Birthday ( L’anniversaire , 1915) and Blue Lovers ( Les amoureux en bleu , 1914). *Chagall quote from My Life , first English edition in 1960, Orion Press, New York G a llery 307: Tradition and Revolution “I painted everything I saw. I painted at my window. I never went out on the street with my box of paints.” * During World War I, many Jews were forced to leave their homes, situated on the front line of the conflict, and accused of being enemy collaborators by the czarist regime. It w as during these years that Zionism began to garner supporters — most significantly with the Balfour Declaration — as well as detractors. In the midst of this international confrontation, Marc Chagall revisited themes related to his own identity and the folkl ore and ethnographic heritage of his people. 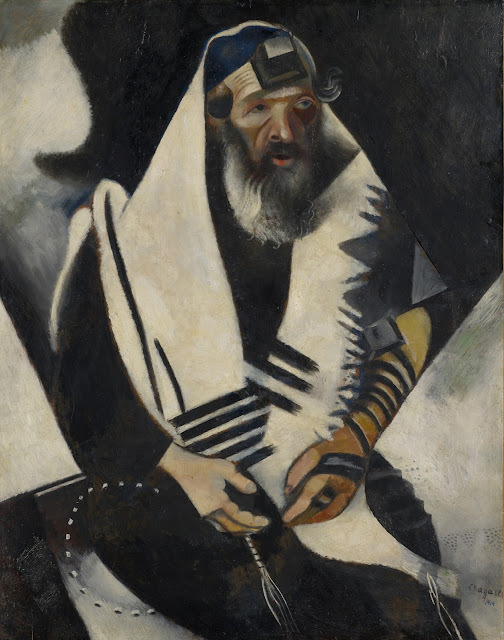 Some of his most important works from this period are the Jews in green, red, and black and white, mistakenly known as the “four great rabbis” and reunited exceptionally here, as three of them are at the Kunstmu seum Basel on long - term loan while Jew in Red ( Le Juif rouge , 1915) belongs to the collections of the State Museum of St. Petersburg, Russia. These paintings are an example of what Chagall called “documents”, because he did not paint them from memory, as in Paris, but by observing the people and objects around him, from a newspaper vendor or beggar to a clock or a mirror, to which he added highl y significant elements such as tallits, phylacteries, and texts in Yiddish, Hebrew, or Cyrillic script. Displayed in this gallery are two identical works known as t he Rabbi , painted over a decade apart due to the Great War. 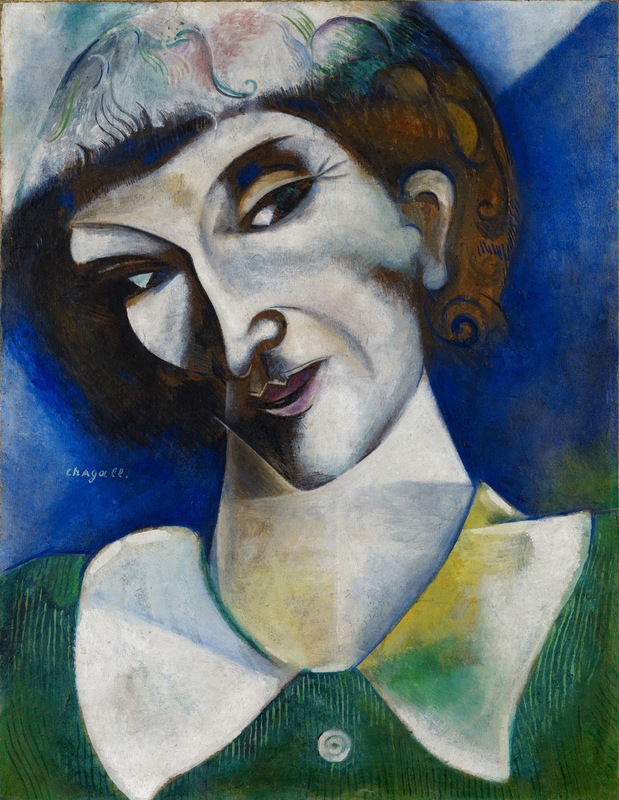 While he was stuck in Russia, some of Chagall’s acquaintances gave him up for dead, including his Berlin gallerist, who sold many of the works he had left at Der Sturm in 1914 to private collectors. Chagall mourned the loss of these works and decided to recreate some of them, producing several versions of his most important compositions. A case in point is Jew in Black and White ( Le Juif en noir et blanc , 1914), of which there are three known versions today. In the years since the Russian Revolution of 1905, Jewish upper - class citizens and intellectuals who occupied prominent positions in the cities were gradually granted some of the freedoms they had hitherto been denied. As a result, Chagall joined the Jewis h Society for the Encouragement of the Fine Arts (JSEFA) and actively participated in its exhibitions. This society gave him several important commissions, such as painting murals at a secondary school — for which he made the preparatory drawings The Pram or Little Carriage ( “La voiture d’enfant” ou “La calèche”, 1916 – 17) included in this exhibition — and illustrating books in Yiddish such as Peretz’s The Magician ( Der Kuntsenmakher , 1915), as well as an important set design commission from Alexander Granowsky for the Moscow State Jewish Theater, represented here by Study for Music (Fourth Panel of the Moscow State Jewish Theater) ( Étude pour La musique [ Quatrième panneau pour Le Théâtre d’art juif de Moscou], 1917). He also took part in major events like the Jack of Diamonds show and joined the artists’ union. 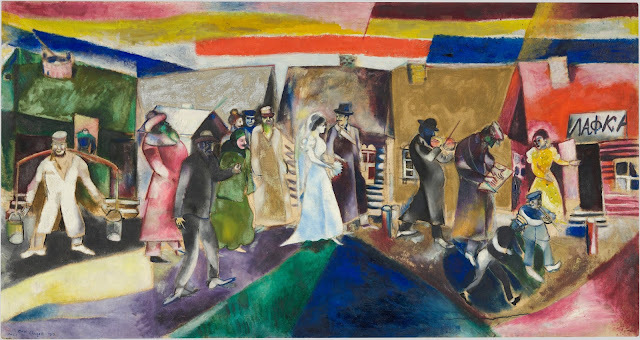 Like other Jews, Chagall saw the revolution as the solution to social inequality and was actively involved in the early efforts to create a new Russia. In 1918 he was appointed Commissar of Arts for Vit ebsk, a position that gave him authority over the museums, art schools, and all artistic events in the region. During those years, he lived with his wife Bella and their daughter Ida in his hometown and founded the People’s Art School, inviting fellow artists like Lissitzky and Malevich to participate in his educational initiative. However, Problems due to artistic and conceptual differences soon arose, and Chagall withdrew from the project in early 1920 and left Vitebsk, bringing this decisive phase of his life to a close. This exhibition explores the early work of Marc Chagall. His creative breakthrough came at a time when his life was torn between contrasting experiences. Chagall lived in Paris from 1911 until 1914, creating paintings that combined his recollections of Russian provincial life with iconic fragments of the metropolis around him. Reminiscences of Russian folk art make an appearance in his works from the period, as do the most recent stylistic experiments he was exposed to through his life in the center of the artistic avant-garde and his acquaintance with many of the most progressive artists, including Picasso, Robert and Sonja Delaunay, and Jacques Lipchitz. Overtaken by the outbreak of World War I during a visit back home, Chagall was forced to spend the next eight years in Russia. The unexpected change of circumstances initially prompted a phase of searching self-scrutiny that speaks from many paintings and works on paper created in and after 1914. The artist produced numerous self-portraits, depictions of Jewish life, and designs for the stage setting for the celebration of the first anniversary of the October Revolution that he organized in his role as the commissar for arts and director of the art school in Vitebsk in 1918. The exhibition displays a representative selection of works from what was for Chagall a period of rapid artistic evolution and personal as well as political upheaval. The core of the show consists of the extraordinary ensemble of major paintings in the collections of the Kunstmuseum Basel and the Im Obersteg Foundation as well as eminent works on loan from Swiss and international private and public collections. They are complemented by documentary ethnographic photographs the Russian artist Solomon Yudovin took in 1912–1914 during the so-called Gintsburg Expeditions into Russia’s shtetlekh, in an attempt to capture a world constantly endangered by pogroms, political unrest and social dynamics. Yudovin’s photographs preserve the rich traditions of shtetl life that profoundly informed Chagall’s oeuvre.